These are just examples, most all of my humbuckers are custom versions, except for the P.A.F. set. Please use the contact page to discuss your requirements and get a quote. 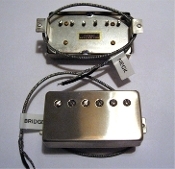 The design possibilities on this style of humbucking pickup are vast.